http://www.attractionchecklist.com – John B. deHaas is back and this episode we ride a Disney’s Animal Kingdom opening day attraction DINOSAUR. Learn a little about the ride, experience the ride audio and then listen in as John and I deliver our longest review of a ride ever. Recorded on March 22, 2018. 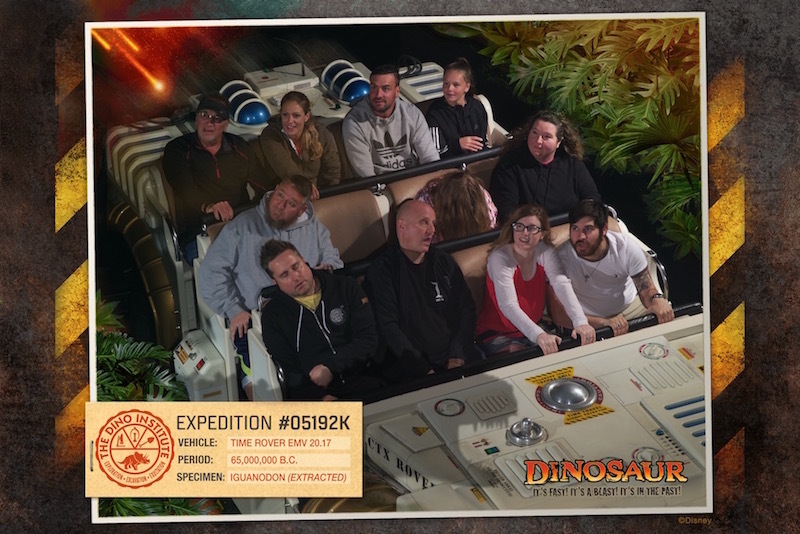 This episode we are headed back to Walt Disney World to ride DINOSAUR atDisney’s Animal Kingdom. The guide map describes this attraction in the following manner, “Take off on a rip-roaring prehistoric tour in the dark to save a dinosaur from extinction. There is a height requirement of 40” for this attraction and the Thrill Level describes the attraction as a Thrill ride with Small Drops that is Dark and Scary. Fastpass+ is available for this attraction. Before we head off to the Dino Institute, here are five fast facts about DINOSAUR at Disney’s Animal Kingdom. 1. DINOSAUR is a Disney’s Animal Kingdom opening Day attraction, opening with the park on April 22, 1998. 2. DINOSAUR uses the same ride vehicles and a very similar track layout to the Disneyland Attraction Indiana Jones and the Forbidden Eye. The storylines are, obviously, different. 3. For about 3 years after the attraction opened, it was called Countdown To Extinction. The name was changed to DINOSAUR on May 1st, 2001 to tie in with the Disney movie of the same name. A few subtle references to the older name can still be seen in the attraction, most notably on the ride vehicles that are each stamped with the name CTX Rover. 5. Finally, in the loading are, guests can look up and see three pipes, one red, one yellow and one white. All three have chemical formulas written on them. These are the formulas for Ketchup, Mustard and Mayonnaise. This is a throwback easter egg from when the ride was originally sponsored by McDonalds. With the learning out of the way, let’s hop in our Rovers and head back in time and ride DINOSAUR. I have included the preshow in this recording but I have edited a bit of the time between the preshow and boarding the ride vehicles so things move a little quicker. Along for the fun today is John B. deHaas and after we ride we’ll discuss our thoughts oaths attraction. If you’d like to see our ride photo from this ride through, beside to visit the show notes page for this episode, episode 45 over at AttractionChecklist.com. As usual, this is a binaural recording so if you have headphones, now is the time to put them on as we are headed to Disney’s Animal Kingdom to ride DINOSAUR.